Mr. Smith's Old Fashioned French Custard | Instantwhip Foods, Inc. The French custard tradition of making frozen desserts is a classic – lush with fresh cream and eggs – it offers a creamier, more dense feel than traditional ice cream because it has 10-15% less air. 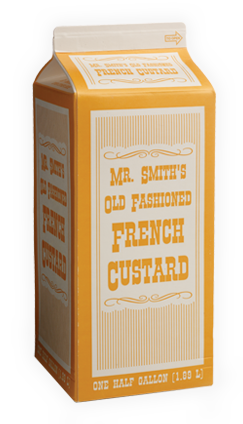 INSTANTWHIP’S own MR. SMITH’S FRENCH CUSTARD has a 10% butterfat base and contains at least 1.4% egg yolk solids. Dispense our custard in any commercial soft freezer, ice cream batch freezer or custard machine to create either the simple and/or the gourmet treats that suit your needs. Ordering INSTANTWHIP® MR. SMITH’S OLD-FASHIONED FRENCH CUSTARD couldn’t be easier – whether it’s from your local Route Sales Team, online or with a phone call. MR. SMITH’S FRENCH CUSTARD’s exceptional smoothness and homemade like taste are the result of the dairy fresh cream and eggs that go into each container. It’s great as is, or a wonderful base for your own frozen custard flavors. Be sure to add liquid flavors before freezing, and solid ingredients as dispensing. If product is delivered frozen, keep frozen until ready to use. Thaw under refrigeration for 48 hours or until there are no ice crystals in mix. Shake product vigorously before pouring into freezer. Follow your machine manufacturer’s instructions on priming the machine properly to achieve desired overrun.